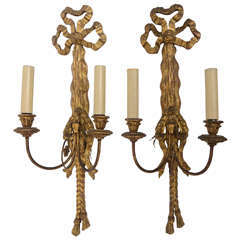 Pair of Italian giltwood sconces, hand-carved with three arms each and newly wired for use within the USA. 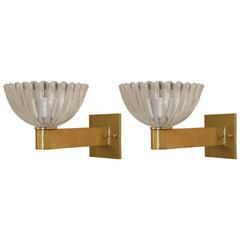 Sconces include new back plates, finished to match sconces, to comply with UL Standard. Wear consistent with age and use. Newly-wired (candelabra-size bulbs) for use within the USA. 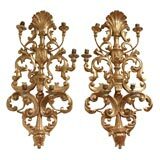 Sconces Include new back plates. 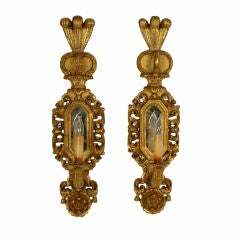 Pair of crystal and carved giltwood sconces from Genoa, Italy, circa 1920-1940. 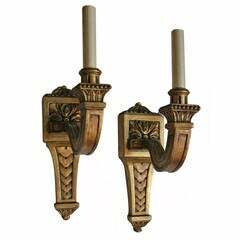 Each sconce features five arms, newly wired for use within the USA. 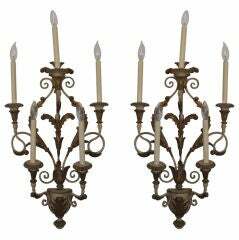 Two large beaded gilt-iron sconces with five lights each, newly-wired for use within the USA. Sold as a pair. 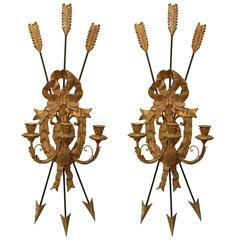 Pair of Italian giltwood wall sconces. 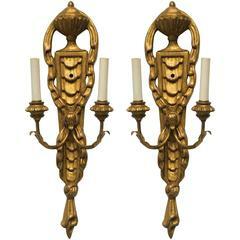 A pair of three arm Italian giltwood sconces with French horn style arms. The center column, with wheat top carving and reeded torch. The finish is weathered gilt. 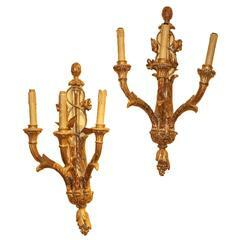 Pair of Italian baroque style giltwood wall sconces, circa 1920-1940. 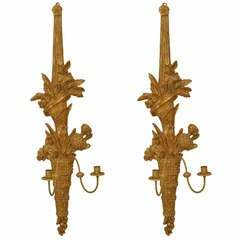 Monumental Pair of Carved Giltwood Wall Sconces with very shallow arms. 5 lights per sconce. Have been electrified, need rewiring. 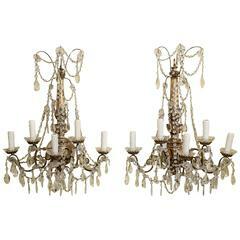 Pair of Italian giltwood and gesso sconces.